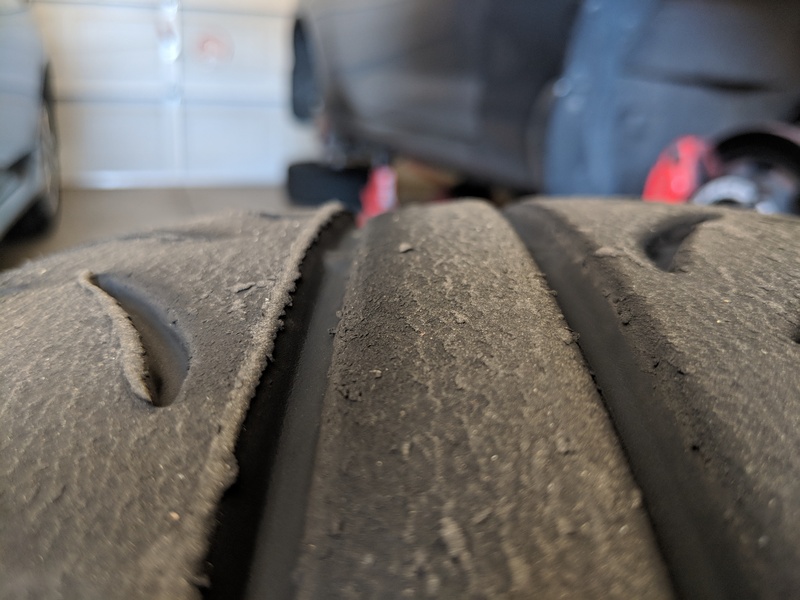 Tire Wear Questions - Miata Turbo Forum - Boost cars, acquire cats. 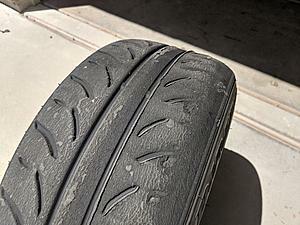 Have 3 track days and maybe a hundred or two street miles on these new Dunlop Direzza ZIII's. Previous had the zII Star Specs, they lasted probably 10k street miles and probably 10 track days before they were completely done. I feel like these ZIII's are not at all going to live as long. Granted, 2 of the 3 days were at a track known to eat tires, and all three were in ~ 90F temps. Running 35 PSI hot. I have a full season of track days under my belt, but still drive towards the front of the Novice group (our org has only 3 classes). Car is essentially stock, minus better brakes and cooling. Would appreciate if anyone can take a look at the pics, these are the front tires. 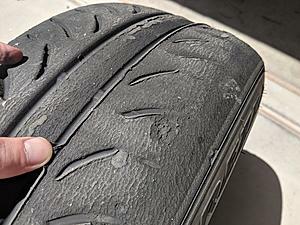 The middle piece of tread is much more worn towards one edge than the other. There's quite a bit of missing rubber, visible as little "craters". At least some of the missing rubber looks like it goes pretty far down. There's an odd strip of rubber along one edge too - you can see me holding it up in the picture. The outside edge of the tire is also a noticeably different color than the rest of the tread. My main question - Is this typical wear, and appears accelerated because I'm actually using the tires now, or is something wrong? Car has had a recent alignment, as best it can get with all stock suspension. 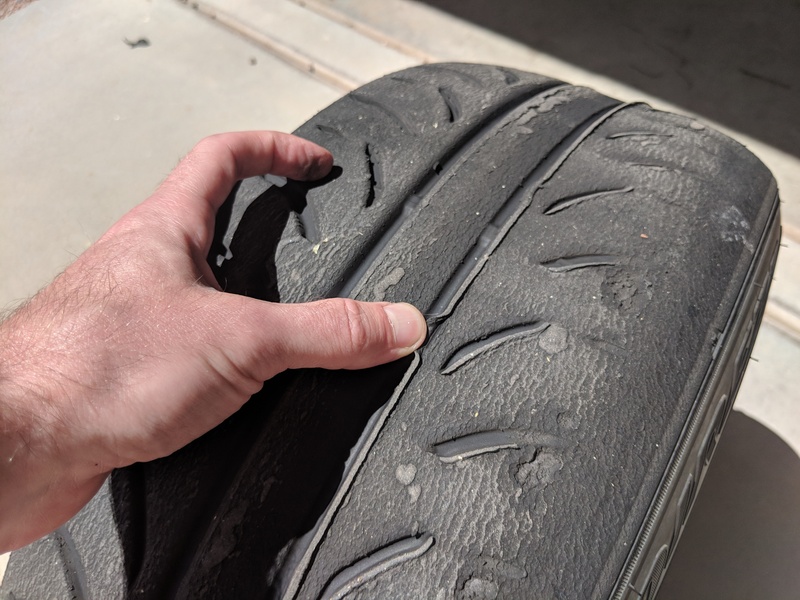 Maybe 35 PSI is way too high? I'm seeing wear down into the little triangles on the side, so I'm afraid to go much lower. Could my 18 year old stock suspension that's essentially bumpstop-less be the cause? I’m far from an expert, but your suspension probably isn’t doing you any favors with that much tire. I’m running less tire than you, 320tw Sport Comp 2’s in 195/55/15), and I re-did my suspension with Bilstein shocks and FM springs (2x stock spring rate). Running toward the front of the novice pack, I get on the bumpstops pretty often. If your bump stops are shot, you’re probably way deep in the suspension travel with bad geometry. 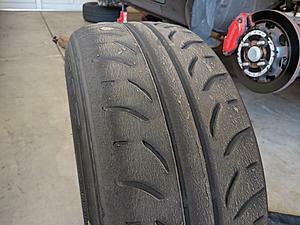 I was actually thinking that when I move up to 200tw tires, I might need more spring than I have. Suggestions: update your suspension with rebuilt billies and coil over sleeves, build an alignment string setup, buy a probe type tire pyrometer. You need more camber or stiffer springs to reduce body roll.